The new Very Best of series from Prestige Records offers an excellent opportunity to hear relatively early material from some of the most legendary figures in jazz. One of the first artists in this series is Miles Davis, who recorded for the label from 1951 to 1956. 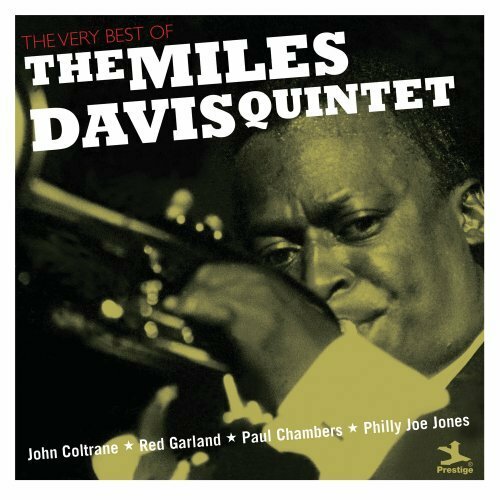 The Very Best of the Miles Davis Quintet is particularly interesting, as it features most of what would come be known as his first “great” band. The ten tracks on this single CD feature almost the full group who would record the legendary Kind of Blue in 1959. Besides Miles, the quintet includes John Coltrane (sax), Paul Chambers (bass), Philly Joe Jones (drums), and Red Garland (piano). Besides the addition of Cannonball Adderly, the major change between the Prestige quintet and that of Kind of Blue was the swap of Red Garland for Bill Evans. It definitely signaled a major shift in direction, considering the contributions Evans made to Blue, but that is beside the point. Garland was certainly no slouch when it came to tickling the ivories, as is shown quite clearly here. I mention this because of all of the acclaim Kind of Blue has garnered over the years, and in comparison this material has received very little. A big reason for this is probably the haphazard manner in which these performances were issued over the years. As Miles became more and more famous, the “vaults” would be raided, and albums with imaginative titles such as Workin’ with the Miles Davis Quintet, Steamin’ with the Miles Davis Quintet, and Relaxin’ with the Miles Davis Quintet would be released. “My Funny Valentine” is another highlight of Miles’ fifties oeuvre, and one he played live for years afterwards. This is the one cut of the ten that Coltrane sat out on however, for some reason. It is interesting to hear the Quintet cover a Dave Brubeck tune, “In Your Own Sweet Way.” Not only is it a fine piece of music, but on a professional level, only Brubeck’s Time Out ever really competed with Kind of Blue as the definitive Beat-era jazz album. This whole Very Best of series is great, but this Miles collection in particular is a must for those who have not previously heard the man’s pre-Kind of Blue music. Highly recommended.